Pachter: Disc-Free Xbox One Would Be "Dumb Dumb Dumb"
Wedbush analyst Michael Pachter doesn't believe the rumors of a disc-less Xbox One and if it's true, thinks it would be "one of the dumbest ideas of all time." Yesterday, news broke out that Microsoft is said to be testing and considering a disc-less version of the Xbox One that will be sold at a cheaper price point. 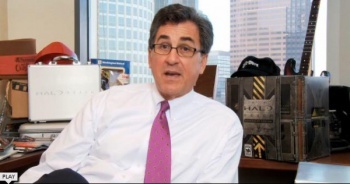 While some people might think that's a good idea, Wedbush Morgan analyst Michael Pachter isn't one of them. The analyst says he doesn't believe the rumor and if it's true, it would be "one of the dumbest ideas of all time." I don't actually believe the rumor. If this rumor is true, it is one of the dumbest ideas of all time. It would alienate GameStop and other retailers, and it would demonstrate that Microsoft can afford to release a 1TB Xbox One at $399 with essentially the same production cost as the $499 model with a 500GB HDD and a Blu-ray drive...That would likely cause gamers to believe that the model with a Blu-ray drive is overpriced, or would cause them to believe that Microsoft is greedy...I have three words for this idea - dumb, dumb, dumb. Could Pachter have a point? Would Microsoft releasing a disc-less version of the Xbox One do more harm than good even at a lower entry point? Earlier this month, Pachter pegged the PlayStation 4 to triumph over the Xbox One and also thinks Nintendo should consider "getting out of the Wii U business."